Available up to filtration efficiency of 95% for 1micron particle size. (Overall filtration efficiency by using discrete particle count efficiency test method). Manufactured in standard sizes as mention below and also for the customer's specific sizes. Options of "Hi - Loft" or "Needle punched" synthetic non woven filtration media or "Melt blown" synthetic filtration media. Pleated media for enhanced surface area, higher dust holding, higher air handling capacity & lesser P.
Optimum pleat density to achieve lowest possible pressure drop for a given air flow rate. 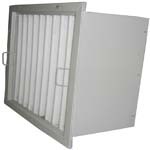 Suitable pleat retaining mechanism at air exit side to avoid pleat collapse and to ensure maximum utilization of the effective media area. Aluminium pipes rigidly fixed to the casing with PPCP studs at each pleat act as pleat supports. 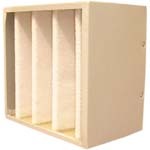 Epoxy or PU resin or synthetic foam used to bond and seal filtering media to the casing. Best option for applications involving high dust concentration and where servicing and re-using the filter becomes unavoidable. Multiple layers of mono filament synthetic woven fabric of suitable mesh size and mono filament thickness stitched together and used as the filtration media. Available with a filtration efficiency of 90% for 5 micron particle size (Efficiency by using discrete particle count efficiency test method). 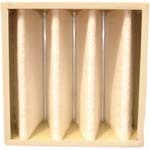 Similar to Air cleanable rigid pocket fine filters in all other parameters. Can be manufactured with any number of pockets with pocket depths upto 600 mm subject to design conditions. Designed for optimum number of pockets and pocket depth to achieve lowest pressure drop to a given air flow rate. Filtration media will be "Melt blown" synthetic with ultrasonic welded pockets. Internally ultrasonic welded soft spacers prevent pocket ballooning. GI pocket supports hold each pocket and the pockets are mechanically fixed and also glued to each other and also the casing to give a leak free and rigid filter. 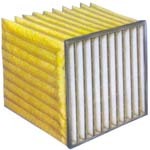 Pocket filters cannot be serviced / cleaned and are basically disposable type extended surface filters. Characterized by low weight and comparatively smaller shipping volume.